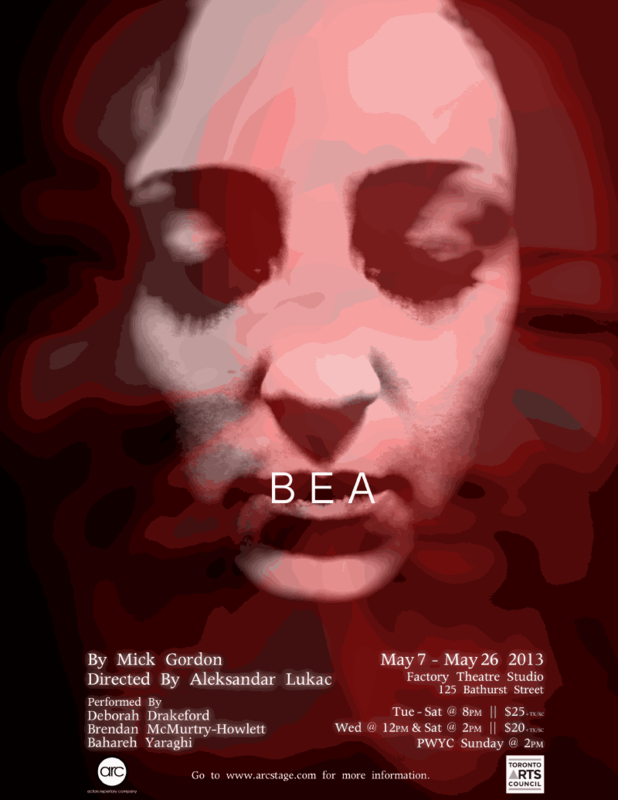 The 2012-2013 Actors Repertory Company season culminates with the North American premiere of BEA, by UK playwright Mick Gordon. BEA is a touching drama, by turns comedic and heart-wrenching; the story of a remarkable young woman struggling to find her voice while suffering from a debilitating illness, and the difficult choices she faces with determination, joy and humour. Creating a new shape. Central playing space, One big bedroom. The bed. A lucky find, solid and structural. Thought we’d have to build it. Preset – Bahareh in the bed as audience enters. Tech rehearsal. Bahareh Yaraghi, Deborah Drakeford, Brendan McMurtry-Howlett.